If you look at the top picture you can see all the problems with the old one. First of all the top has creases in it, one right through central London, the other one a lot further to the West! Also the legs are very prone to twisting. It’s the one direction they’re not strong in and as weight and time have taken their toll, they’ve given up that way. It started with the cut ends of the legs snagging on the carpet if it was pushed out of the way so I added some extra circular reinforcing bits but it still managed to twist. The second picture shows what happened when I let my elder two boys (aged 5 and 8) loose on the table. 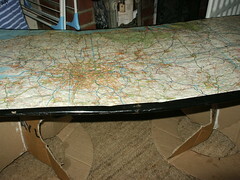 We stripped off the map layer as that was covered in sticky back plastic and the rest is ready to go in the recycling. It’s been Christmas so it’ll go in the bin once its been emptied. Strangely I don’t feel that sad as it was never designed to last for years. 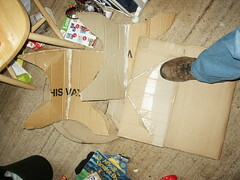 I invested a few hours in it along with some old cardboard boxes. I learnt lots and I had well over a year’s good use out of it. And now it’s being recycled as was always the plan. Next Next post: >And in with the new!